A Turkish fighter jet launched a missile at a Russian bomber on Tuesday well ahead of the Su-24 approaching the Turkish border, the chief of Russia’s Air Force said. The bomber remained on Turkish radars for 34 minutes and never received any warnings. The commander shared with the media previously unknown details of what happened on Tuesday. 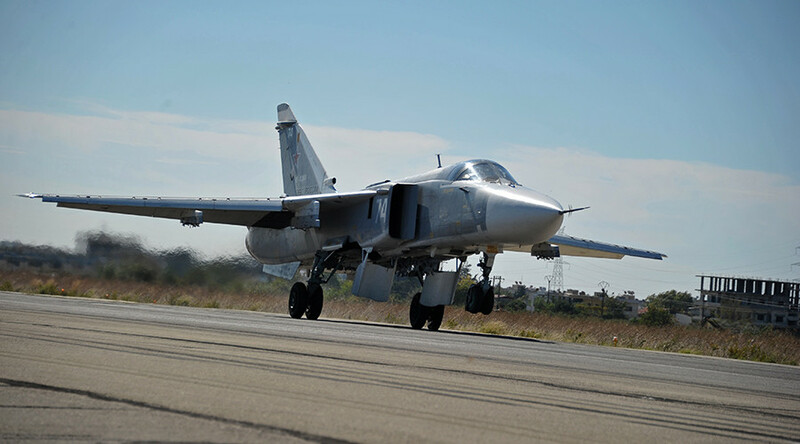 On November 24, a pair of Russian Sukhoi Su-24 tactical bombers took off from Khmeimim airbase in Latakia at 06:15 GMT, with an assignment to carry out airstrikes in the vicinity of the settlements of Kepir, Mortlu and Zahia, all in the north of Syria. Each bomber was carrying four OFAB-250 high-explosive fragmentation bombs. Ten minutes later, the bombers entered the range of Turkish radars and took positions in the target area, patrolling airspace at predetermined heights of 5,800 meters and 5,650 meters respectively. Both aircraft remained in the area for 34 minutes. During this time there was no contact between the crews of the Russian bombers and the Turkish military authorities or warplanes. Some 20 minutes after arriving at the designated area, the crews received the coordinates of groups of terrorists in the region. After making a first run, the bombers performed a maneuver and then delivered a second strike. Immediately after that, the bomber crewed by Lieutenant-Colonel Oleg Peshkov and Captain Konstantin Murakhtin was attacked by a Turkish F-16 fighter jet operating from the Diyarbakır airfield in Turkey. To attack the Russian bomber with a close-range air-to-air missile, the Turkish fighter jet had to enter Syrian airspace, where it remained for about 40 seconds. Having launched its missile from a distance of 5-7 kilometers, the F-16 immediately turned towards the Turkish border, simultaneously dropping its altitude sharply, thus disappearing from the range of Russian radars at the Khmeimim airbase. The Turkish fighter moved two kilometers into Syrian airspace while the Russian bomber at no stage violated Turkish airspace, Bondarev stressed. The crew of the second Su-24M had a clear view of the moment the missile was fired from the Turkish F-16, and reported this to base. Commander Bondarev noted that a pair of Turkish F-16Cs had been in the area close to the attack zone for more than an hour prior to the attack, which explains their presence in the area. The time needed to get the aircraft ready at the Diyarbakır airfield and travel to the attack zone is an estimated 46 minutes. One of Turkish F-16Cs stopped its maneuvers and began to approach the Su-24M bomber about 100 seconds before the Russian aircraft came closest to the Turkish border, which also confirms the attack was pre-planned, Commander Bondarev stressed. The chief of Russia’s Air Force also called attention to the readiness of the Turkish media, which released a professionally-made video of the incident recorded from an area controlled by extremists a mere 1.5 hours after the Su-24 was downed. Commander Bondarev also mentioned the memorandum of understanding regarding the campaign in Syria, signed by Moscow and Washington on October 26. In accordance with this agreement, the Russian side informed its American counterparts about the mission of the two bombers in the north of Syria on November 24, including the zones and heights of operation. Taking this into account, the Turkish authorities' statement on not knowing which aircraft were operating in the area raises eyebrows, Bondarev said. The Turkish military not only violated all international laws on protecting national borders, but never delivered an apology for the incident or offered any help in the search and rescue operation for the Su-24 crew. The Su-24’s pilot, Lieutenant-Colonel Oleg Peshkov, was shot dead by militants while parachuting to the ground, having ejected from the stricken aircraft. His partner, navigator Captain Konstantin Murakhtin, survived being shot at while parachuting and managed to stay alive on the ground in an area full of terrorists. 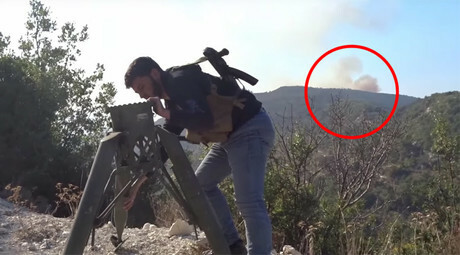 The rescue operation took several hours and eventually recovered Murakhtin, although one Russian Marine in the team was killed when the rescue helicopter was destroyed by a US-made tank missile launched by the extremists – an incident they filmed and published online. Commander Bondarev specifically stressed that the Russian pilot who survived the attack was actively looked for not only by the jihadists, but also by a number of unidentified and technically well-equipped groups. 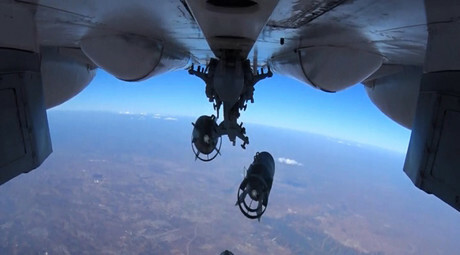 After Captain Murakhtin was rescued, the Russian Air Force delivered “more than massive, devastating” airstrikes against the militants in the region where the operation had been taking place, Bondarev reported.